Growing consumption of bottled water and rising health-consciousness among consumers has significantly boosted the growth of packaged drinking water market in past few years. The key factors affecting the increase in packaged drinking water consumption in Asia Pacific region are: poor-quality tap water in developing countries, higher income levels, and international tourism. Together, these factors are propelling the demand for bottled water, and it is probable that as income grows and tourism increases, further growth in demand will follow. Moreover, premium water categories which are sourced from special locations and flavored water are gaining popularity among high income consumer and young consumers who are sensitive changing trends. Goldstein Research analyst forecast the Asia Pacific packaged drinking water market to expand at a CAGR of 12.2% during the forecast period 2016-2024. Further, the market is anticipated to reach USD 83.6 billion by the end of forecast period owing to new product launches of water bottles and growth of the tourism industry in Asia Pacific region. The report covers the present ground scenario and the future growth prospects of the packaged drinking water market for 2016-2024 along with the total revenue of packaged drinking water market in every region. We calculated the market size and revenue share on the basis of revenue generated per segment, regional and country level. The revenue forecast is given on the basis of number of packaged drinking water manufacturers and current growth rate of the market. Based on product type, prepared water accounted for the highest market share of 60% in 2016 and will continue to dominate the market during the forecast period. However, mineral water is expected to be the fastest growing segment over the forecast period. 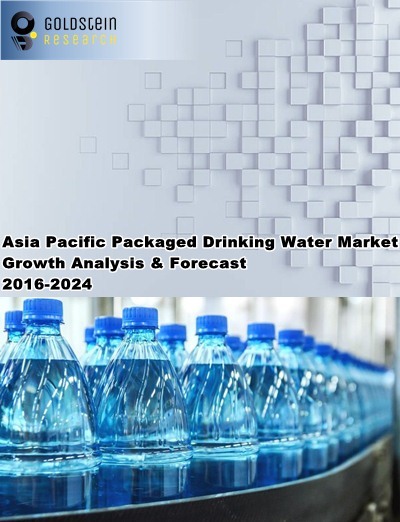 Asia Pacific packaged drinking water Market Outlook 2016-2024, has been prepared based on an in-depth market analysis from industry experts. The report covers the competitive landscape and current position of major players in the Asia Pacific packaged drinking water market. The report also includes porter’s five force model, SWOT analysis, company profiling, business strategies of market players and their business models. Asia Pacific packaged drinking water market report also recognizes value chain analysis to understand the cost differentiation to provide competitive advantage to the existing and new entry players. According to our Asia Pacific packaged drinking water market study on the basis of extensive primary and secondary research, one major trend in the market is growth of premium natural mineral water. Currently nearly 85% of the sales for natural mineral water come from institutions such as hotels, restaurants, fitness clubs and air ports. The majority of the sales happen either in metro cites or tourist destinations such as across Asia Pacific. Key consumers include mostly the tourists and high profile customers who demand only premium products. According to the report, major driver in Asia Pacific packaged drinking water market is growing health consciousness population coupled with strong economic growth. Asia Pacific region has the largest population in the world, and its population will continue to grow over the next few years at significant pace. As consumers continue to worry about water safety and hygiene, the growing economy and population could continue to have a positive impact on packaged drinking water sales in the coming years. Further, the report states that one challenge in Asia Pacific packaged drinking water market is availability of large number of unorganized players. Unorganized players often provide poor quality packaged drinking waters at much lower cost and are eating organized players revenue share in majority of Asia Pacific countries. Geographically, China accounted for the largest market share of 45% revenue in Asia Pacific packaged drinking water market. China is closely followed by the India, which accounted for USD 8.1 billion of the market size in 2016. South East Asian counties showcase immense potential for the growth of packaged drinking water market attributed to the growing tourism industry and rising disposable income.